Triangle patterns are a commonly-used technical analysis tool. It is important for every traderCareersSearch CFI's career resources library. We've compiled the most important career resources for any job in corporate finance. From interview prep to resumes and job descriptions, we've got you covered to land your dream job. Explore guides, templates, and a wide range of free resources and tools to recognize patterns as they form in the marketEquity Capital Market (ECM)The equity capital market consists of the primary and secondary market where stocks are traded. This market includes dealer and OTC markets. The equity capital market is a subset of the broader capital market, where financial institutions and companies interact to trade financial instruments and raise equity capital. Patterns are vital in a trader’s quest to spot trends and predict future outcomes so that they can trade more successfully and profitably. Triangle patterns are important because they help indicate the continuation of a bullish or bearishBullish and BearishProfessionals in corporate finance regularly refer to markets as being bullish and bearish based on positive and negative price movements. A bear market is typically considered to exist when there has been a price decline of 20% or more from the peak, and a bull market is considered to be a 20% recovery from the bottom market. They can also assist a trader in spotting a market reversal. Ascending triangles are a bullish formation that anticipates an upside breakout. Descending triangles are a bearish formation that anticipates a downside breakout. Symmetrical triangles, where price action grows increasingly narrow, may be followed by a breakout to either side, up or down. Ascending triangle patterns are bullish, meaning that they indicate a security’sPublic SecuritiesPublic securities, or marketable securities, are investments that are openly or easily traded in a market. These securities are either equity or debt-based. An equity security is an investment based on the equity of a company. A debt security is an investment based on the debt of a company or entity price is likely to climb higher as the pattern completes itself. This pattern is created with two trendlines. The first trendline is flat along the top of the triangle and acts as a resistance point which – after price successfully breaks above it – signals the resumption or beginning of an uptrend. The second trendline – the bottom line of the triangle that shows price support – is a line of ascension formed by a series of higher lows. It is this configuration formed by higher lows that forms the triangle and gives it a bullish characterization. The basic interpretation is that the pattern reveals that each time sellers attempt to push price lower, they are increasingly less successful. The ascending triangle pattern forms as a security’s price bounces back and forth between the two lines. Prices move to a high which inevitably meets resistance that leads to a drop in price as securities are sold. Although the price may fail to overcome the resistance several times, this does not lead to increased power for sellers, as evidenced by the fact that each sell-off after meeting resistance stops at a higher level than the previous sell-off attempt. Eventually, price breaks through the upside resistance and continues in an uptrend. In many cases, the price is already in an overall uptrend and the ascending triangle pattern is viewed as a consolidation and continuation pattern. In the event that an ascending triangle pattern forms during an overall downtrend in the market, it is typically seen as a possible indication of an impending market reversal to the upside. Because the ascending triangle is a bullish pattern, it’s important to pay close attention to the supporting ascension line because it indicates that bears are gradually exiting the market. Bulls (or buyers) are then capable of pushing security prices past the resistance level indicated by the flat top line of the triangle. As a trader, it’s wise to be cautious about making trade entries before prices break above the resistance line because the pattern may fail to fully form or be violated by a move to the downside. There is less risk involved by waiting for the confirming breakout. Buyers can then reasonably place stop-loss orders below the low of the triangle pattern. Based on its name, it should come as no surprise that a descending triangle pattern is the exact opposite of the pattern we’ve just discussed. This triangle pattern offers traders a bearish signal, indicating that price will continue lower as the pattern completes itself. Again, two trendlines form the pattern, but in this case the supporting bottom line is flat, while the top resistance line slopes downward. Just as an ascending triangle is often a continuation pattern that forms in overall uptrend, likewise a descending triangle is a common continuation pattern that forms in a downtrend. If it appears during a long-term uptrend, it is usually taken as a signal of a possible market reversal and trend change. This pattern develops when a security’s price falls but then bounces off the supporting line and rises. However, each attempt to push prices higher is less successful than the one before, and eventually sellers take control of the market and push prices below the supporting bottom line of the triangle. This action confirms the descending triangle pattern’s indication that prices are headed lower. Traders can sell short at the time of the downside breakout, with a stop-loss order placed a bit above the highest price reached during the formation of the triangle. 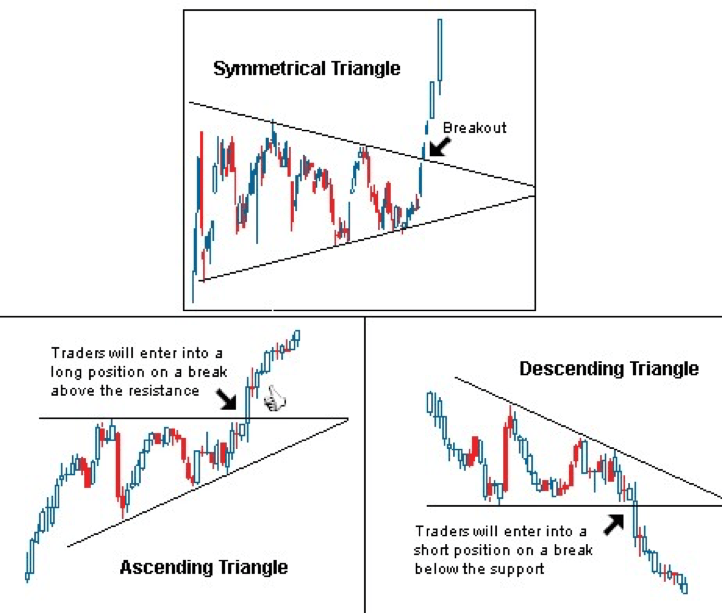 Traders and market analysts commonly view symmetrical triangles as consolidation patterns which may forecast either the continuation of the existing trend or a trend reversal. This triangle pattern is formed as gradually ascending support lines and descending resistance lines meet up as a security’s trading range becomes increasingly smaller. Typically, a security’s price will bounce back and forth between the two trendlines, moving toward the apex of the triangle, eventually breaking out in one direction or the other and forming a sustained trend. If a symmetrical triangle follows a bullish trend, watch carefully for a breakout below the ascending support line, which would indicate a market reversal to a downtrend. Conversely, a symmetrical triangle following a sustained bearish trend should be monitored for an upside breakout indication of a bullish market reversal. Regardless of whether a symmetrical triangle breakout goes in the direction of continuing the existing trend or in the direction of a trend reversal, the momentum that is generated when price breaks out of the triangle is usually sufficient to propel the market price a significant distance. Thus, the breakout from a symmetrical triangle is usually considered a strong signal of future trend direction which traders can follow with some confidence. Again, the triangle formation offers easy identification of reasonable stop-loss order levels: below the low of the triangle when buying, or above the triangle high if selling short. In the end, as with any technical indicator, successfully using triangle patterns really comes down to patience and due diligence. While these three triangle patterns tend toward certain signals and indications, it’s important to stay vigilant and remember that the market is not known for being predictable and can change directions quickly. This is why judicious traders eyeing what looks like a triangle pattern shaping up will wait for the breakout confirmation by price action before adopting a new position in the market. MACD OscillatorMACD Oscillator - Technical AnalysisThe MACD Oscillator is used to examine short-term moving average convergence and divergence. The MACD Oscillator is a double-edged technical indicator in that it offers traders and analysts the ability to follow trends in the market, as well as gauge the momentum of price changes.